Adobe has announced new features for its suite of video and audio production products, which will be released later this year. The enhancements include innovations in virtual reality/360, animation, motion graphics, editing, collaboration and Adobe Stock, many powered by Adobe Sensei, the company's artificial intelligence and machine learning framework. Saving Time. It's all about being more productive. "Video is the fastest growing medium in communications and entertainment," said Bryan Lamkin, senior vice president of Digital Media at Adobe. "Whether you're an online creator, global media company or filmmaker, you need to deliver world class content across all platforms and formats at incredible speed"Adobe is breaking new ground in collaboration, social sharing and analytics to accelerate workflows for all video creators." The announcement comes just before the International Broadcasting Conference this year in Amsterdam and after Apple's announcement that macOS High Sierra will drop support for Final Cut Studio, including Final Cut Pro 7, in favor of Final Cut Pro 10.3.4+. The company recently briefed us on the updates and our report follows. Bill Roberts, senior director of product management, introduced the 2017 updates with a picture of the long view. He reported a prediction that by 2021 82 percent of Internet traffic will be video. And he wasn't talking about an avalanche of social media or conferencing, but about half of that will be "well-produced video" with options for 2D and 3D productions. Which makes it a challenging time for video creators. What's the one thing they all need? More time. From camera to consumer, the industry has been revolutionized. The camera is a computer with a lens on it. The pace of innovation has increased tremendously. And the route to your audience can travel many paths. It's easy to publish to an audience, but you have to look professional. Adobe, he said, is helping video creators work with anything the camera can capture, make it easy to mold to your vision and efficient to deliver to your audience. Patrick Palmer, Premiere product manager, discussed a few highlights of the new release. Multiple Open Projects. 'Tabs' on top indicate each project. The first addresses one of those every day tasks that are time consuming, like timeline gaps. As you edit, you create gaps in your timeline. With a new magic button, you can close those gaps. And if there are few gaps you want to reserve, you can protect them. Preferences now has 16 label colors, up from 8, to keep complex projects organized. You can also make your own color (like bright red, which is not included). You will be able to make projects read-only with a lock icon on the bottom left of the project window. You can also open multiple projects and you can copy assets by reference instead of moving the full, large files around. For virtual reality production, effects now respect mapping to a sphere. So when you get to the edge of the world, you don't fall off. It's round. You can also mirror headset views and include handheld controllers in the view. 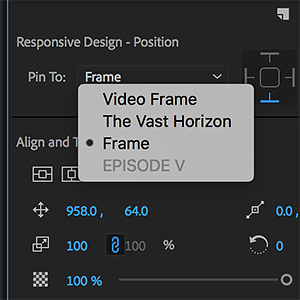 In the Essential Graphics panel, you will be able to protect intro and outro durations as you compress a sequence, which Adobe calls responsive video design. You can also pin the certain graphics to text so if, for example, you extend a boxed headline, the box is extended as the text is. You no longer have to manually resize the box when you change the headline. Motion graphics will be coming to Adobe Stock, he said. And finally, Team Project under Edit will allow version control of projects with auto saves that provide unlimited undo of local changes. Victoria Nece discussed the new features coming to After Effects. And they were impressive, starting with data-driven animation. Data-driven animation, she explained, treats data like footage. It makes data a first-class citizen. Change the data and the animation changes. She demonstrated with a JSON data file After Effects read to draw shapes and animate them interactively. Data Driven. A graphic drawn by the data. You can apply various data sets to the same illustration. A map of the U.S., for example, could be used for election returns or linguistic tendencies. There was no coding involved. Draw the graphic, enter the data, that's it. There are also new time-saving buttons for to create a New Composition or a New Composition From Footage, something that should have been there from the beginning. After Effects also taps into the GPU for performance enhancements. Using the CPU alone might produce 3 frames per second but with the GPU, the same rendering can hit 19 fps. The company does publish a list of compatible GPUs. There's also a keyboard shortcuts editor with a visual map of the keyboard. And a font panel with improved type handing in general, she said, including ligature support. Bronwyn Lewis talked about the changes to Audition, which included more time savers. You can choose which tracks to duck another track by now (or every other one). It updates dynamically or with manual control, too. There's now a timecode overlay, as well. Staked clips retain their layered Z order so they don't disappear. You can cross fade using handles on the new clip and make symmetrical fades using a modifier key. Mix downs are now 250 percent fast. And there are more channel IDs, too, not just Left and Right. Victoria Nece returned to announced Character Animator will finally make its v1.0 release. New Trigger Interface. More control than the keyboard. New features include pose-to-pose movements that resemble keyframe animation, a visual map of a character's capabilities in Controls, use of midi keys or the keyboard, the addition of wave forms, a new triggers interface that is more controllable than keyboard triggers. Rigging has been enhanced, too with auto stapling so no tool is required. Just drag the parts together to connect them. Adobe didn't disclose a release date but Creative Cloud subscribers will be access the new versions as soon as they become available. SAN JOSE, Calif. -- Adobe has revealed advancements to its Adobe Creative Cloud video tools and services to be showcased at IBC 2017. To help filmmakers and video professionals create standout content, Adobe will highlight the latest innovations in virtual reality/360, animation, motion graphics, editing, collaboration and Adobe Stock, all available later this year. Many of these features are powered by Adobe Sensei, the company's artificial intelligence and machine learning framework. Adobe will preview these advancements at Stand 7.G27 in the RAI Amsterdam Convention Center and at 140 partner booths from Sept. 15-19 at IBC. "Video is the fastest growing medium in communications and entertainment. Whether you're an online creator, global media company or filmmaker, you need to deliver world class content across all platforms and formats at incredible speed," said Bryan Lamkin, senior vice president of Digital Media at Adobe. "Adobe is breaking new ground in collaboration, social sharing and analytics to accelerate workflows for all video creators." Adobe Creative Cloud and Premiere Pro have become the platform of choice for professional editors around the world from Hollywood to Bollywood including high-profile productions: Al Gore's "An Inconvenient Sequel: Truth to Power" from co-directors Bonni Cohen and John Shenk, "Mindhunter" from executive producer and director David Fincher, "Only the Brave" from director Joseph Kosinski and "6 Below" from director Scott Waugh. Media companies are making history by bringing characters to life with Character Animator, such as Bean on Facebook Live and through the work of online content creators like Valentina Vee, Jouelzy, Rooster Teeth and Rachel Nguyen. In April, motion graphics templates were introduced, bringing the power of After Effects to Premiere Pro through easy-to-use templates. Editors wanting to work with dynamic, professional graphics or graphics packages created in After Effects, such as titles, lower thirds, bumpers and closing credits, will soon be able to access motion graphics templates right in Adobe Stock and through Creative Cloud Libraries. 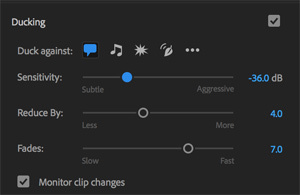 In addition, Adobe has made usability improvements to the Essential Graphics panel in Premiere Pro, including responsive design options for preserving spatial and temporal. 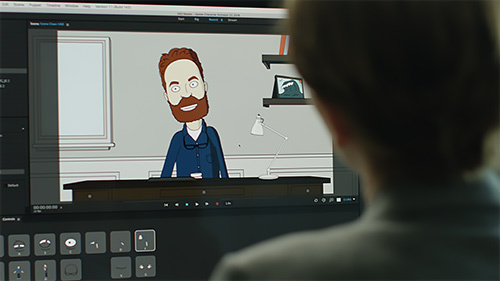 Character Animator 1.0 is unveiled with changes to core and custom animation functions, such as pose-to-pose blending, new physics behaviors and visual puppet controls. Adobe Sensei helps improve lip-sync capability by accurately matching mouth shape with spoken sounds. Virtual reality video creation will be possible with a dedicated viewing environment in Premiere Pro. Editors can experience the deeply engaging qualities of content, review their timeline and use keyboard driven editing for trimming and markers while wearing the same VR head-mounts as their audience. In addition, audio can be determined by orientation or position and exported as ambisonics audio for VR-enabled platforms such as YouTube and Facebook. VR effects and transitions are now native and accelerated via the Mercury playback engine. With the release of Team Projects, Adobe has improved collaborative workflows on the Local Area Network with managed access features that allow users to lock bins and provide read-only access to others. Formerly in beta, the release of Team Projects will offer smoother workflows hosted in Creative Cloud and the ability to more easily manage versions with auto-save history. Adobe Audition adds flexible session organization to multi-take workflows and continuous playback while editing. Powered by Adobe Sensei, auto-ducking is added to the Essential Sound panel that automatically adjusts levels by type: dialogue, background sound or music. Adobe Stock continues to build the most comprehensive creative marketplace with over 90 million assets including photos, illustrations and vectors. Customers now have access to over 4 million HD and 4K Adobe Stock video footage directly within their Creative Cloud video workflows and can now search and scrub assets in Premiere Pro. Coming to this release are hundreds of professionally-created motion graphics templates for Adobe Stock, available later this year and allow editors to leverage some of the best designed motion graphics. Additionally, motion graphic artists will be able to monetize their work and sell Motion Graphic templates for Premiere Pro through Adobe Stock. Earlier this year, Adobe added editorial and premium collections from Reuters, USA Today Sports, Stocksy and 500px. Pond5 collections introduced in April further expand the premium and video offering.